« Do You Trust Uncle Sam to Deliver on Healthcare? The Treasury Department is selling $118 billion in debt this week, just as Congress tackled a $940 billion health-care bill over the weekend, shining the spotlight on the U.S.’s hefty fiscal commitments. Budget-deficit and debt levels are forecast to worsen: Total deficits including interest costs are set to remain above $1 trillion in the next decade, according to Barclays Capital. But longer-dated U.S. government debt is as popular as ever, even at the measly 3.689% and 4.580% yields that 10- and 30-year Treasurys are paying, respectively. That popularity is supported by a single, compelling economic fact: Inflation is dead. There you go. The WSJ said it, so it must be right. The policy wonks in Washington continually repeat it, so they must be right, too. Or are they? What has been the result of all this liquidity running into the system? A significant decline in the value of our dollar. The dollar has stabilized over the last few months, especially against the Euro given problems primarily in Greece…for now. What does that create? Inflation. That’s good, right? A little inflation will provide some pricing power which supports our equity market. Not so fast. The inflation is not directly addressing the deflationary pressures in real estate and likely deflationary pressure in wages. The inflation is being generated primarily in commodities. What does that mean? Prices for food, gas, oil, and other raw material inputs will increase. As those prices increase, the cost of living in America will increase. Regrettably, that increase in cost of living will not be offset by an increase in wages. Are we experiencing this decline in prices for housing and wages on one side versus an increase in prices for consumer goods, fuel, and services on the other? Let’s dig a little deeper. If you remove housing costs from the consumer price index, inflation looks positively resurgent. In January, the CPI was up an annualized 5.8%, excluding owners-equivalent rent, which is a rough proxy for housing costs. Inflation is dead? Perhaps in housing (and also wages) it is, but certainly not in the other components of the consumer price index. How do you think increased healthcare costs for businesses will be handled? A combination of layoffs and lessened hiring along with passing the costs down to consumers. 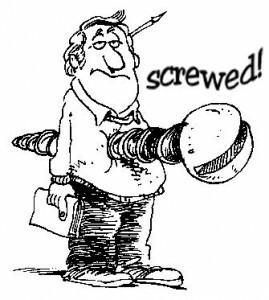 Feel like you’re getting screwed? You are. Our friends in Washington, on Wall Street, and especially at the Federal Reserve have no interest in highlighting this reality, but your friend here at Sense on Cents is solely concerned with helping you navigate the economic landscape. This entry was posted on Tuesday, March 23rd, 2010 at 1:47 PM	and is filed under deflation, General, Housing Crisis, Inflation. You can follow any responses to this entry through the RSS 2.0 feed. You can leave a response, or trackback from your own site.